(Courtesy of Slowking4, Wikimedia Commons). Workers from two dining halls hand-delivered petitions to Residential & Dining Enterprises (R&DE) management on Tuesday, lodging a complaint against what they describe as “chronic understaffing” and “unacceptable workloads” that they say the department has ignored for over a year. (The Stanford Daily Photo Team). 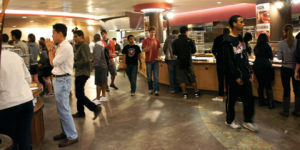 Addressed to assistant director of Residential Dining East Campus Bob McClenaghan, the documents spell out concerns from workers who service Arrillaga Family Dining Commons and Gerhard Casper Dining Commons, respectively. During their break on Tuesday, a group of about 20 workers entered McClenaghan’s office to hand off the petitions with representatives from their union, SEIU Local 2007. The union and its stewards – workers who act as a liaison between their peers, the union and the University – have received an uptick in complaints about understaffing, according to Arrillaga steward Luis Carriel. In recent weeks, he said, an increasing number of members have sought him out to report experiences of getting yelled at for not working fast enough and to say that they were exhausted from doing the work of multiple people. According to the petition sent to Arrillaga Dining, the dining hall has vacant positions for food service workers of category III, IV and V, which current workers “desperately need” the management to fill. Carriel says that the problem is not new. For the last year during monthly “summit” meetings with management, he says his concerns have been brushed aside, with administrators citing long-term factors such as stiff competition for new hires with local employers Google and Facebook as reasons for the lingering vacancies. In an email response to The Daily, Executive Director of Communications at R&DE Jocelyn Breeland described the recent summits with the union as productive and said the petitions came outside established channels of communication between workers and the management. Breeland acknowledged that R&DE faces “the same challenges” as local employers and other branches of the University in “filling all positions,” citing low unemployment rates throughout the country and in the Bay Area. She added that R&DE has taken “a number of steps to recruit and retain skilled workers” amid a “challenging job market,” ranging from passing referral cards for potential hires to employees and the union to taking part in local job fairs to recruiting from a variety of schools. SEIU Senior Organizer Seth Leibson and Carriel also questioned R&DE’s commitment to hiring more staff, pointing to the pool of “casuals” whom they say R&DE could recruit from if it chose to. So-called casuals are workers who may not join the union and do not receive union benefits because they work under the threshold of 20 hours per week for R&DE. Leibson said that he knows of casuals who have stayed in the position for years without prospects of advancement. R&DE disputed the claim that the management is reluctant to hire casual employees. “Casual employees are a talent pool we rely on to fill permanent positions and a significant portion of the current bargaining unit staff initially worked for the University as casual employees,” wrote Breeland. Breeland also challenged the petition’s claim that staffing shortages and overwork have compromised worker well-being. Breeland responded that when employees are unexpectedly absent, R&DE works “diligently” to seek temporary replacements to keep dining hall operations going, and minimizes worker injuries and absences through health and safety programs. On the management’s response to the petitions, workers and R&DE also provided different accounts. Leibson said that Executive Director of Human Resources Ann Marie Mutso was “not happy at all” when the workers submitted the petition and insisted on speaking to union organizers on the side of the office in the absence of the workers. However, Breeland said that Mutso only asked to speak with the union organizers separately to give a safety reminder about non-employees entering the dining hall kitchens. According to Breeland, Mutso offered to speak to the workers about their concerns at the next summit as she did not have a chance to read the petition at the time. On the whole, Breeland said that R&DE aims to foster an “open and [collaborative] relationship” with its employees and SEIU. But workers who signed the petition backed its message of distrust. Contact Fiona Kelliher and Fangzhou Liu at fionak ‘at’ stanford.edu and fzliu96 ‘at’ stanford.edu. Fangzhou Liu ’19 was Vol. 253 Executive Editor; before that, she co-led the news section. She grew up in Singapore and studies computer science and linguistics.